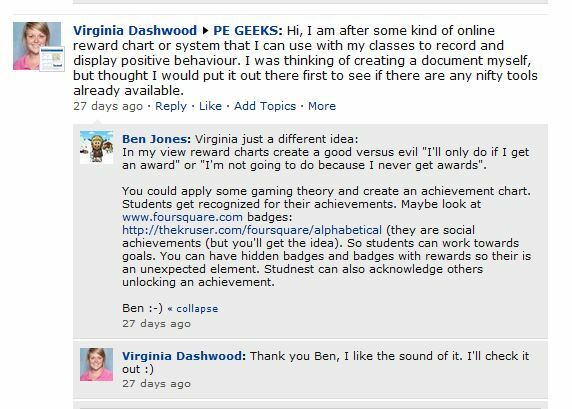 Posted on February 27, 2011 by Brendan Jones Posted in teacherstuff	. As most PE teachers would agree, you can never quite get all kids active in the one lesson. It might be that some kids don’t like the activity, its too hot, too cold etc etc. I guess its always been my quest to get everyone involved and engaged in the work that we do in class. Recently I’ve initiated something in our school’s Year 10 HPE classes that I see as a 21st Century approach to this challenge. I had read a question in a thread in the DET Yammer feed asking about a rewards system to record and display positive behaviour. This got me thinking. I’d seen positive behaviour charts work to engage and motivate students. Why couldn’t it be ramped up, 21st Century style,to include gaming based rewards and get it to work in HPE lessons as well? The birth and growth of the concept was done in a 21st Century way too. The foundations were laid in a collaborative Google Doc, where HPE teachers (worldwide as it happens) were invited to contribute to a list of possible achievement levels or badges that could be awarded in PE lessons. The link for that embryonic document is here. To make it an achievement based strategy, the progression path had to be established. This I took to Twitter again, and then to my staff, the people who would be making it work. The discussion draft of the Achievement Levels and Badges looked like this. The teacher record sheets, where the achievements are marked off, look like this. We will award small badges and certificates to mark the achievements and levels. The measure of success with this scheme will be two fold, we hope. Apart from marks (which we have to collect), I’m looking for anectodal and hard evidence that kids are motivated to engage more generally with PE lessons. Whether that’s because of the sense of achievement provided by the scheme, or otherwise, I endeavour to determine that by surveying the kids. I’ll admit, staff are cautious in their expectations (read – dubious it will work). But I’m willing to bet it will get more than a few in. It’s early days yet, but if the interest already amongst the kids is anything to go by, exciting times could be ahead. I’ll keep you posted. What do you think? Is there a place for gaming based strategies in PE? Tags: 21st Century, activity, engagement, Gaming, GBL, HPE	. Good luck Jonesy, and good on you for having a crack at this…..
First thought – is it a huge amount of admin time chasing and keeping track of who has achieved what, how many times did they bring this or forget that. Have I issued those awards etc etc. Second – How good would it be to incorporate the gaming idea into a LMS (eg Moodle)? Based on conditional activities in 2.0, once a student has achieved certain objectives they are awarded specific badges/levels that could open up new activities, resources etc etc. Thanks for sharing, interested to see your progress. Hi Chris, and thanks for the interest in the blog. Your idea about moving it into something like Moodle is well worth some thought. My experience with Moodle 2.0 is limited, but some way of automating the process would certainly be a welcome innovation.